Beta Analytic, a professional ISO/IEC 17025:2005-accredited radiocarbon dating laboratory, is removing cancellation and partial analysis fees for samples that are too small or do not provide adequate carbon for accelerator mass spectrometry (AMS) dating. To better serve its clients, the lab is simplifying its pricing structure for complicated samples. Taking effect immediately, complications such as insufficient carbon yield after pretreatments, combustion or acidification will no longer incur costs. Beta hopes this initiative will better help its clients build critical chronologies for sites under investigation using the best possible dating strategy for samples that are known to be tiny or complicated. Clients will be able to make better critical decisions using the “best samples” available after laboratory treatments rather than being constrained by budgets to pre-examination observations. “This initiative builds on Beta’s world-renowned comprehensive service for complex samples. This is consistent with Beta’s dedication to give its clients the best possible dating information rather than the common AMS industry practice of selling numbers,” Beta Analytic President Darden Hood states. With advancements in the laboratory, samples containing as little as 100 micrograms of carbon or less may be analyzed using Beta’s standard laboratory practices. The Micro-Sample AMS analysis service is no longer needed for these tiny samples. Beta remains firm that clients should send as large a sample as possible, dating tiny samples only when there is no other option. Samples which are adequate for AMS dating but are cancelled for reasons not associated with sample quality may still incur partial charges. The Beta team is available before, during and after analysis for technical advice on sample selection, analytical protocols in the lab and calibration of results reported. Technical consultation is provided at no extra charge to researchers who have doubts about the suitability of their samples. Submitters are welcome to contact Beta’s experts prior to sending samples to take advantage of their expertise. Based in Miami, Florida, Beta Analytic is a professional ISO/IEC 2005:17025-accredited radiocarbon (AMS) laboratory which has been in operation since 1979. The lab has international forwarding facilities in Europe, Japan, China, Australia, Brazil, Korea, and Taiwan. The lab offers a high-quality Carbon-14 dating service in 14 business days or less with online reporting. Results are routinely available within one week. All technical consultation and quality assurance, including QA reports, are included in the fee. Customer service is available in English, Chinese, French, German, Korean, Italian, Japanese, Portuguese, and Spanish. sample type – charcoal, sediment, water, wood, etc. 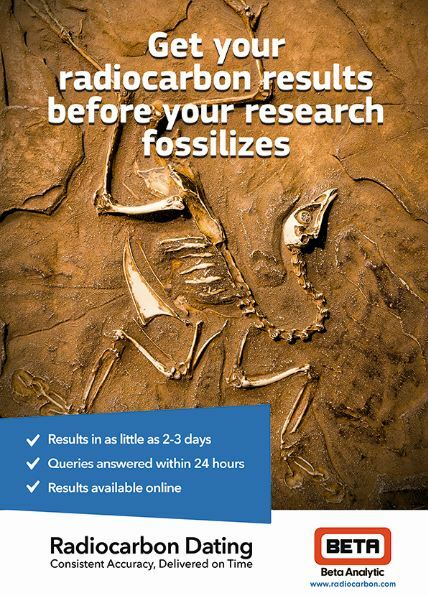 For radiocarbon dating cost inquiries or clarifications, contact the lab. This entry was posted on Friday, July 24th, 2015 and is filed under Uncategorized .